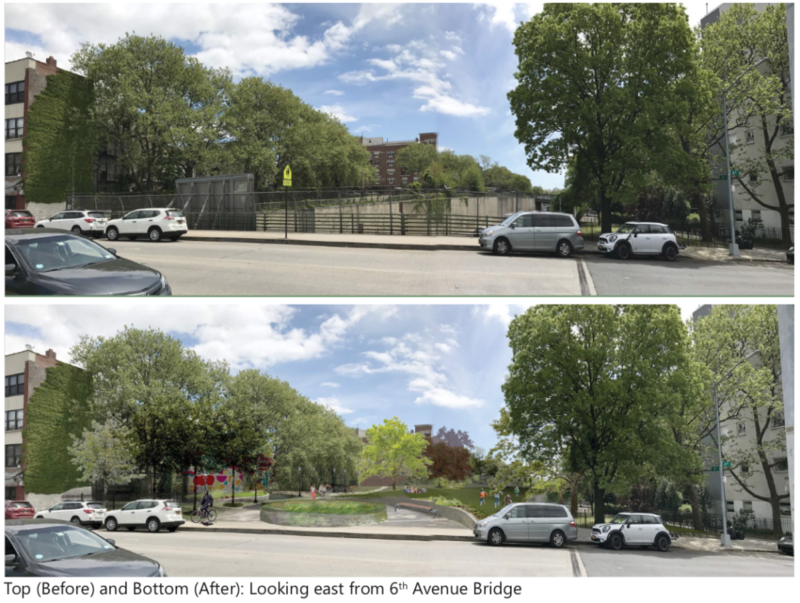 The Prospect Expressway cuts through South Slope, Windsor Terrace, and Greenwood Heights, into Kensington, carving up the communities and impeding connectivity, a reminder of the ambitious and often destructive projects of Robert Moses-era city planning. Now, with a study commissioned by the Borough President and completed over the course of a year by students at the NYU Wagner School of Public Service, proposes ways to stitch the communities back together. 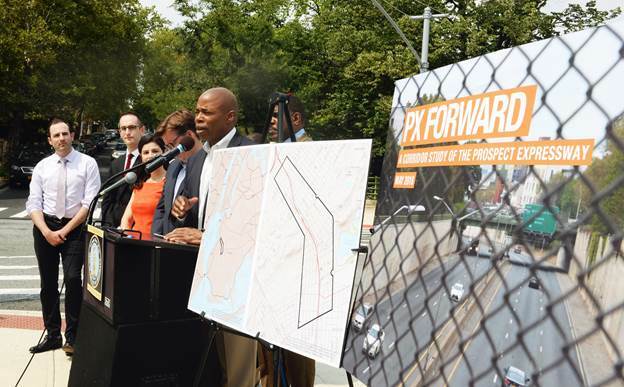 Borough President Adams announced the study yesterday, as well as a letter he sent to the State Department of Transportation, urging them to consider some of the recommendations detailed in the “PX Forward” report. The recommendations come from studying traffic and pedestrian use of the area, looking at similar projects and engaging in community visioning sessions to understand the needs of local residents. The main takeaways? Developing a cyclist and pedestrian path along the expressway, improving and expanding pedestrian decks across the expressway and building up the small parks found in the area, expanding the green space. The original project led to the demolition of more than 400 structures and displaced around 1,200 families. Now, better utilization of space could serve to improve the lives of those who live in surrounding neighborhoods. 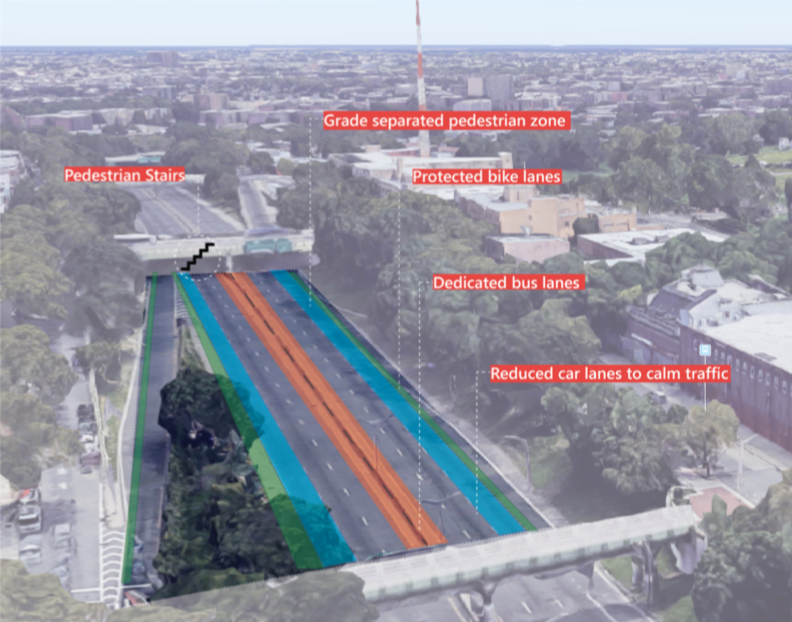 “Boulevarding” the expressway could lead to expanded use, creating pedestrian and bike lanes, as well as dedicating bus lanes and calming traffic with reduced car lanes. 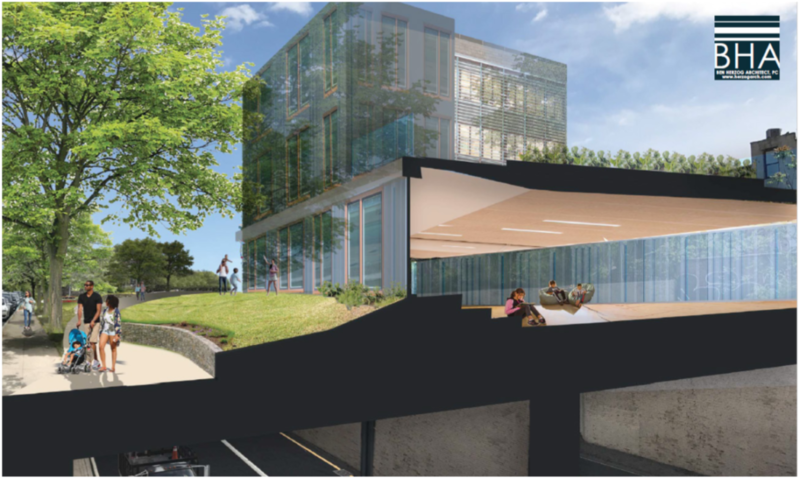 The plan would clearly require major construction work, as well as access from the grade level down to the expressway trench for pedestrians and cyclists. Undoubtedly a massive infrastructure project, “decking” sections of the expressway would lead to the highest possible reclamation and utilization of land. Of course, idyllic renderings of green space are one thing, but reality might be rooted in something a bit more lucrative: development. Covering over sections of the expressway would create a lot of space for developers to push projects, especially when every inch of Brooklyn is suddenly at a premium. Recently, developers revealed plans to build an incredibly ambitious series of developments over the exposed N train tracks in Sunset Park. Other, smaller suggestions from the study include engaging with local artists to beautify “dead” spaces along the expressway and making tweaks to traffic flow to improve the experience of drivers, cyclists and pedestrians. Of course, the study is just that—a preliminary look at things. 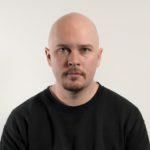 In Adams’ letter, he urges the New York State Department of Transportation to issue a design challenge regarding the expressway in order to generate further ideas about how to improve lives in the neighborhoods. Naturally, all ideas going forward must be generated in close cooperation with the actual residents who call the area home. Ever since moving to Ocean Parkway near the expressway entrance, something like this has been my dream. I assumed it was unrealistic, but now that I see this – maybe? I hope I hope I hope I hope…. What a horrendous idea. Over 500 acre park right there. Cause traffic and waste billions somewhere else please. How about addressing the fundamental and horrendous poor design of the expressway. There is no structural connection to the outbound Gowanus? The traffic backup all day long at the 4th Avenue exit? Or the ‘backyard’ way cars enter the Expressway from 18th Street. Lastly, the most dangerous driving through the Windsor Terrace neighborhood any morning when the Expressway backs up as it seems to happen so frequently. Have seen on more than one occasion cars driving the wrong way on 10th Avenue including one time a School Bus. Stop with the pie in the sky stuff and deal with the dangerous fundamentals! People were paid to do this? I attended a workshop at Holy Name. This looks nothing like what the community wanted. Reminds me of the NYC DoT plan to make 6th & 7th Avenues one-way in Park Slope for the new arena. The overflow crowd at the protest meeting–it wasn’t supposed to be a protest meeting–even brought tar n’ feathers.